Yarrow is a hardy perennial that grows just about anywhere. Flowers appear in mid spring and continue to autumn. The flowers are very small and look like miniature daisies in tight clusters, They are usually white, yellow, pink or lilac. 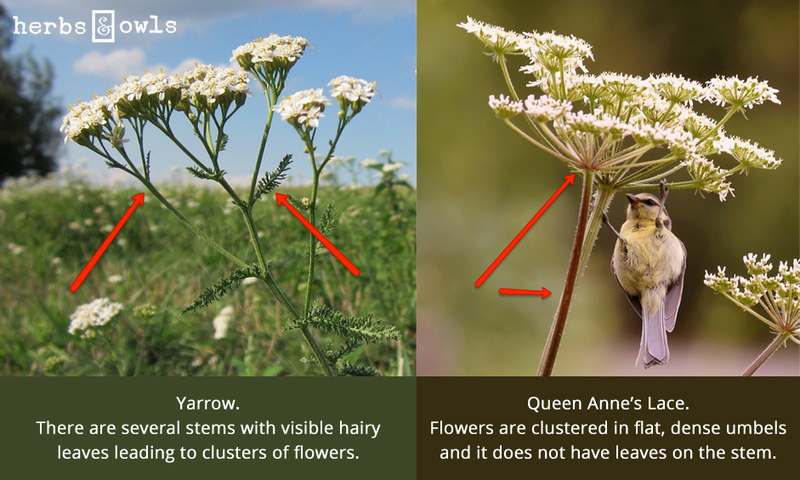 Yarrow can easily be confused with Queen Anne's Lace (also known as Wild Carrot). Harvest Yarrow leaves and flowers just after the flowers open looking vibrant and beautiful. For the strongest medicine, pick it on a sunny day, not when it's wet or been wet the day before. Cut the stem half way down and tie it in bunches. Hang them to dry away from sunlight. When dry, remove flowers and leaves from the stem and break them up into tiny pieces. Store in a tight, dry container. Yarrow is most noted for its ability to stop bleeding. It has a particular affinity for the blood and circulation and can also be used as a general blood purifier because it increases sweating and urination. I have been told that warriors used to carry Yarrow onto the battle field and stuff it in bleeding wounds to stop bleeding. I like to keep a container on dried yarrow in hand as an herbal first aid for the very same use. Yarrow tincture, ointments and salves can be used to help heal mild abrasions and bruises and reduce inflammation. It helps to move and dispel the blood. It can also be useful for old scars as it shifts the matrix of scar tissue so that blood can flow through it. Yarrow taken as a tea can cause sweating, which helps to open up the periphery and pores to release heat from the body and reduce fever. For colds, I like to pair it with Elder, Boneset and Peppermint. Yarrow can help regulate menstrual bleeding. It helps to both bring on menstrual flow and mediate heavy, excessive bleeding. It can also be helpful for restlessness and night sweats associated with menopause. Over the coming days and weeks, continue to shake the tincture, adding more alcohol if necessary to keep the plant material covered. When the oil is ready, decant it through cheesecloth. The oil can be used as-is, keep it in a cool, dry place. To make a salve, warm the oil and add 1 oz. of beeswax to 8 oz oil. To test consistency, put a spoon in the salve then put it in the freezer for a few minutes until it solidifies. Rub the salve to see if you like how it feels. If it's too oily, add more beeswax. Pour the salve into sterile jars while it's still warm. Gather dried Yarrow flowers and leaves. Add 1 teaspoon dried herb to 1 cup of boiling water and steep for 8 hours. Yarrow is a protection essence that seals the energy field and shields us from environmental disturbances (radiation, EMFs, radon) and the emotions of others. Allergies to yarrow are possible. It should not be taken in large doses during pregnancy.